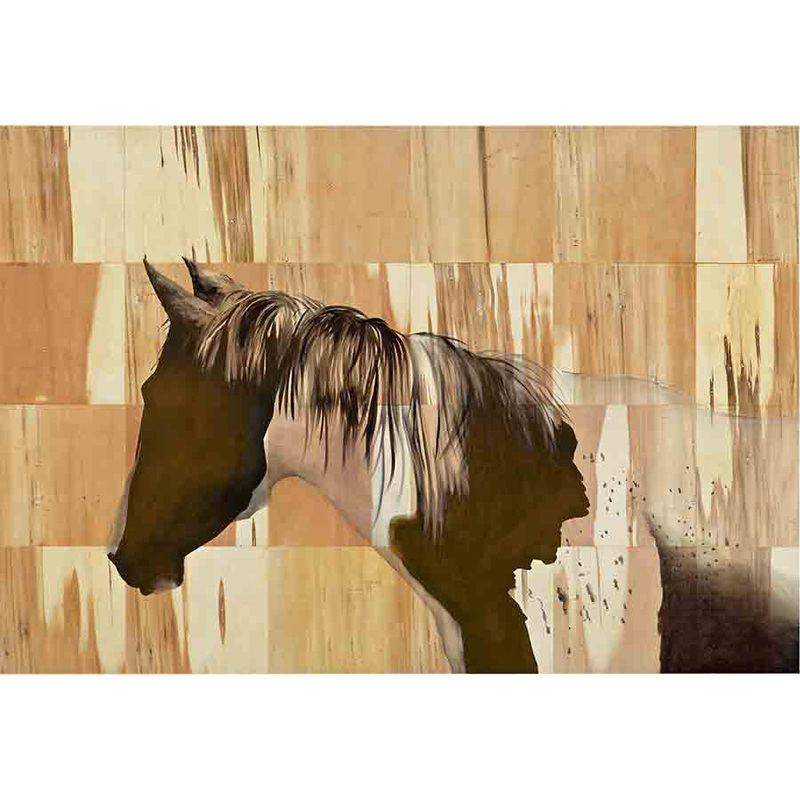 Ian worked in various industries before studying Visual Arts at the Northern Territory University in the mid 1990s. 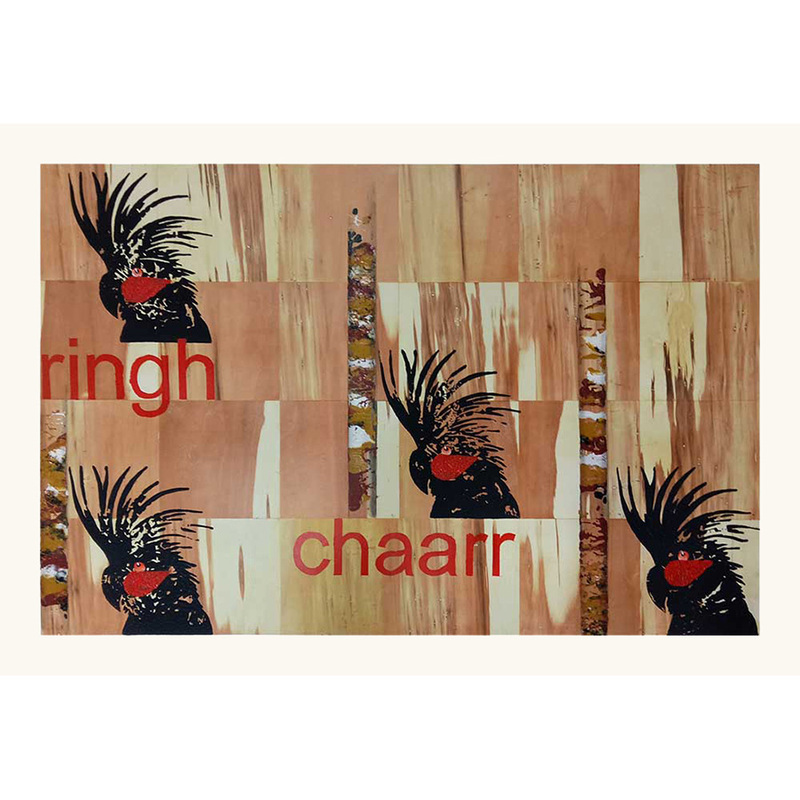 Throughout his art practice he pays tribute to the story of the Kurtjar people in his homeland of the Gulf of Carpentaria. 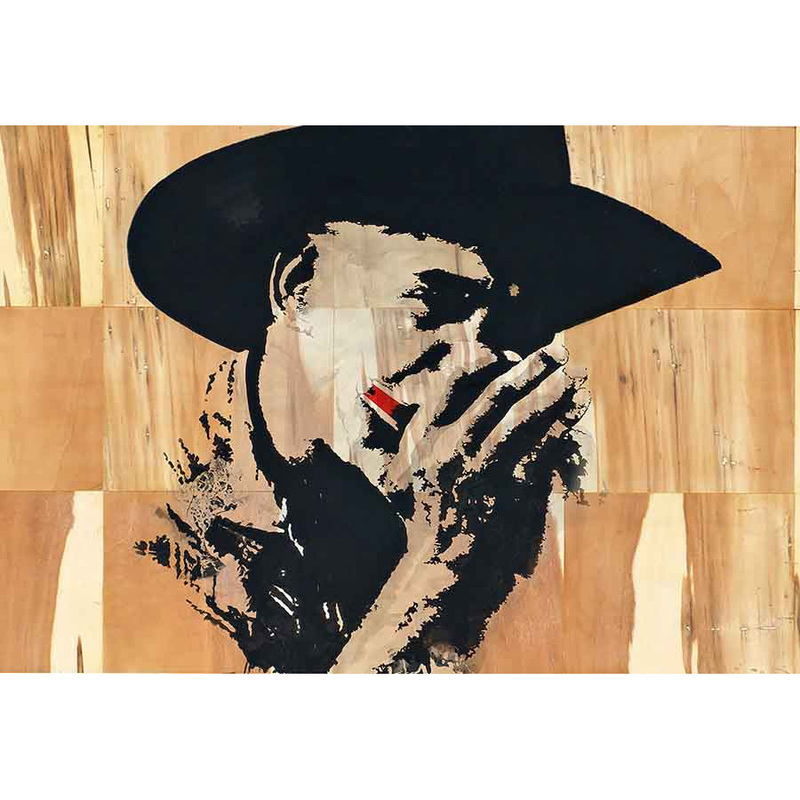 Ian has worked prolifically in his studio in Far North Queensland over the last years and developed a number of series, focusing on paintings and installations. 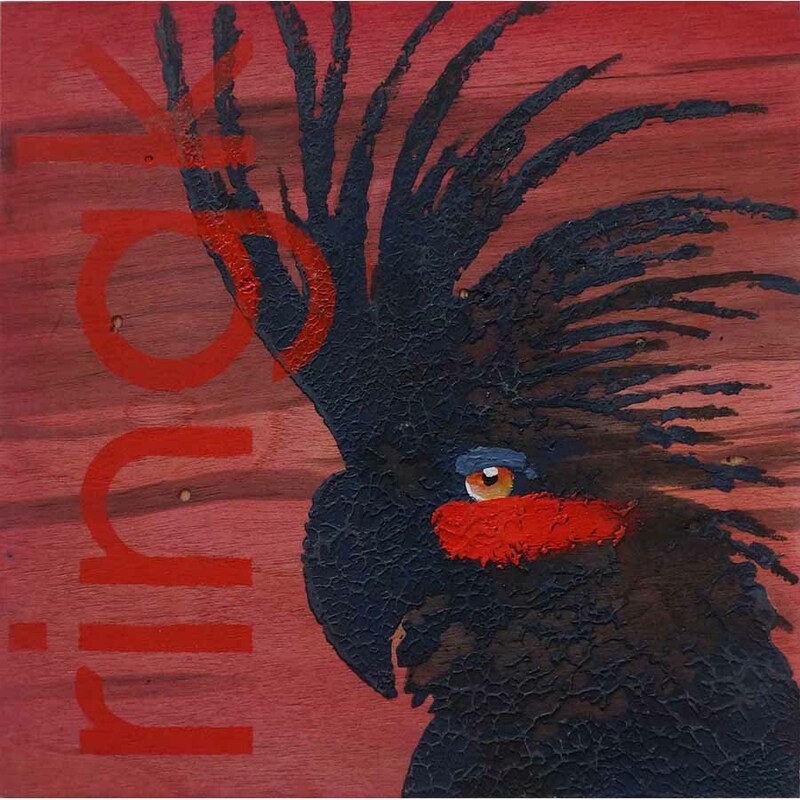 Recurring subject matter in his works comprises characters, sites and memories, which are important to the artist, such as Bloodwood totem and black cockatoo. Ian was the winner of the 2010 Glover Prize, Tasmania, and has been selected as a finalist three times in The Wynne Prize at the Art Gallery of NSW. His works are held in numerous private and public collections nationally. Every work that I have ever painted is anchored in The Gulf one way or another. My art is the visual representation of my identity - I am my country. As a title, The Gulf is my homeland, but also an ambiguous reference to a chasm between two worlds. 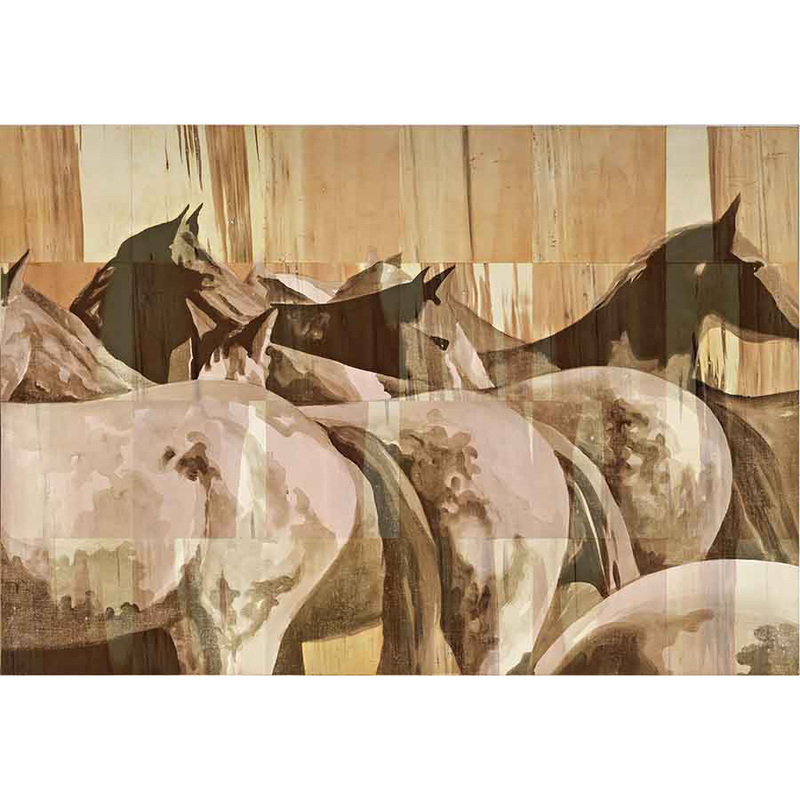 An important part of my practice for many years has been multi-media artwork based on life at Delta Downs Station. Delta is on my traditional country in the Gulf of Carpentaria, Kurtjar country, and is the largest Indigenous owned and managed cattle station in Australia. Many of the historical works have referenced old photographs my mother keeps in a shoe box. Brighton Beach was inspired by one such photograph of a stockman and his wife at their worker’s quarters. The shape of the building, its place in a row of others like it, and the vertical pattern of the corrugated iron immediately reminded me of the typical Brighton Beach bathing boxes…that’s how colour was introduced. Ultimately, this beach could be the Gold Coast or any beach in Australia.. and paradoxically with Hills Hoist and outback dwelling, perhaps becomes quintessentially Australian? … Working as a ticket writer in his teens was the beginning of the artist’s life in the visual arts, an early experience that taught him the power of a cleverly constructed image. 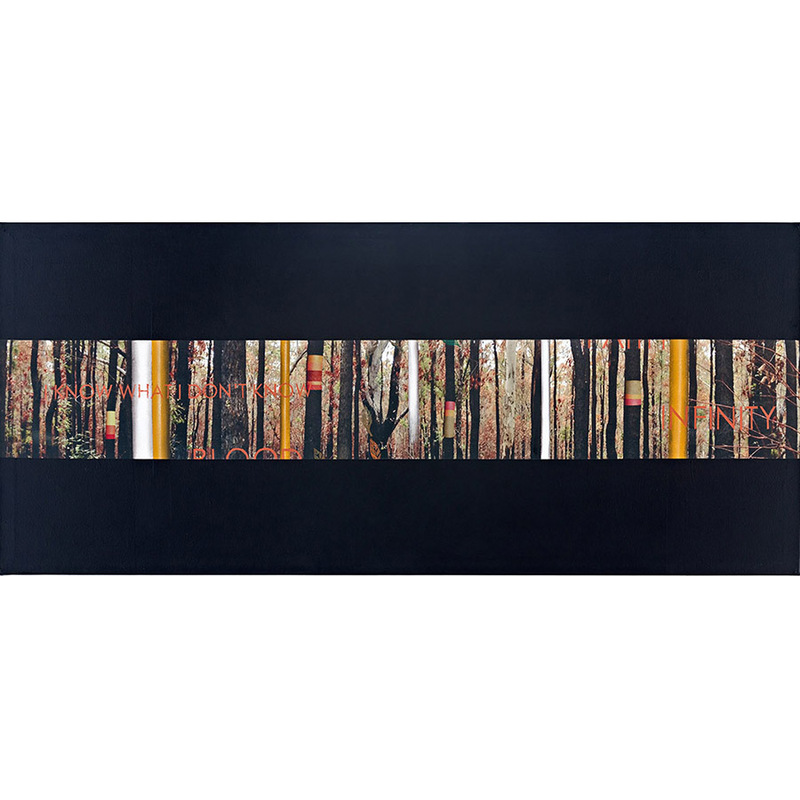 Waldron went on the study fine arts and has been shown in the countries’ most prestigious exhibitions including the Archibald, Dobell and Wynne Prizes and has been awarded best open painting in the 1995 National Aboriginal Art Award and the prestigious Glover Prize for landscape painting in 2010. Waldron’s success as a painter can be attributed to an imaginative working of western art styles to communicate the strength and achievements of the Kurtjar people against seemingly unbeatable odds. Capturing the viewers imagination will create within them curiosity and motivate them to discover more about your art and the stories behind it. This is my goal in the series of black and white paintings, On the Land, which depicts the daily and historical life of my people, Kurtjar, on the Gulf of Carpentaria. So little is known about Indigenous culture on the Gulf, and many people don’t even know where the Gulf is. By painting scenes of contemporary working life, leisure pursuits and important historical themes, I am creating an awareness of our people and their enduring presence and great achievements on their traditional land. These achievements include running and owning the Delta Downs cattle station, one of the largest and the only wholly Indigenous owned and managed cattle station in Australia. This series of works based on food advertising takes me back to the beginning of my art career. The first form of art I did as a paid job was advertising for supermarkets. I created posters for shop window displays which promoted new products and special offers. I honed my skills and became adept at creating eye-catching posters which brought customers through the door. This work taught me the importance of balancing colour, composition and text to engage the viewer, drawing them to make a personal connection with what was on the poster. Advertising and fine art must both have a high degree of novelty to be noticed in the first place, and the technical sophistication to elicit a response in the viewer without offending them. I have always maintained you catch more flies with honey and I like to seduce the viewer, giving them a pleasurable experience while simultaneously communicating personal and cultural imperatives. Without my background in advertising I don’t think I would have such an insight into how the audience responds to visual stimuli. I look back on these days in my youth, working with such imaginative enthusiasm to create appealing poster art, with great warmth which I think is evident in these paintings. It was during this time that I become aware of the power of pairing words with images to communicate and influence thinking. I knew that I could utilise these tools in my fine art practice. Capturing the viewers imagination will create within them curiosity and motivate them to discover more about your art and the stories behind it. This is my goal in the series of black and white paintings I have created depicting the daily and historical life of my people, Kurtjar, on the Gulf of Carpentaria. So little is known about Indigenous culture on the Gulf, and many people don’t even know where the Gulf is. By painting scenes of contemporary working life, leisure pursuits and important historical themes, I am creating an awareness of our people and their enduring presence and great achievements on their traditional land. 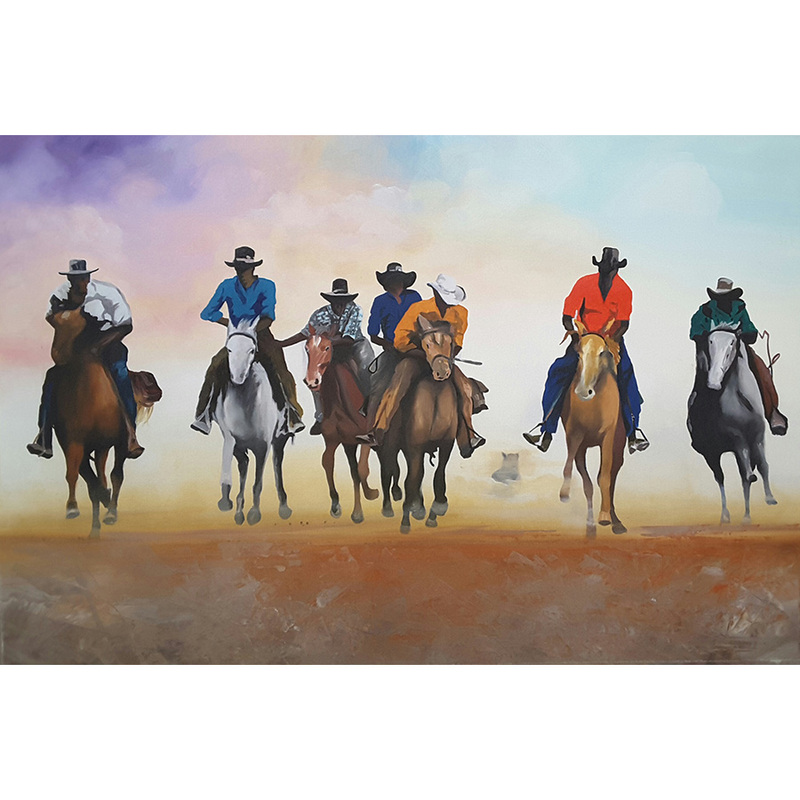 These achievements include running and owning the Delta Downs cattle station, one of the largest and the only wholly Indigenous owned and managed cattle station in Australia. 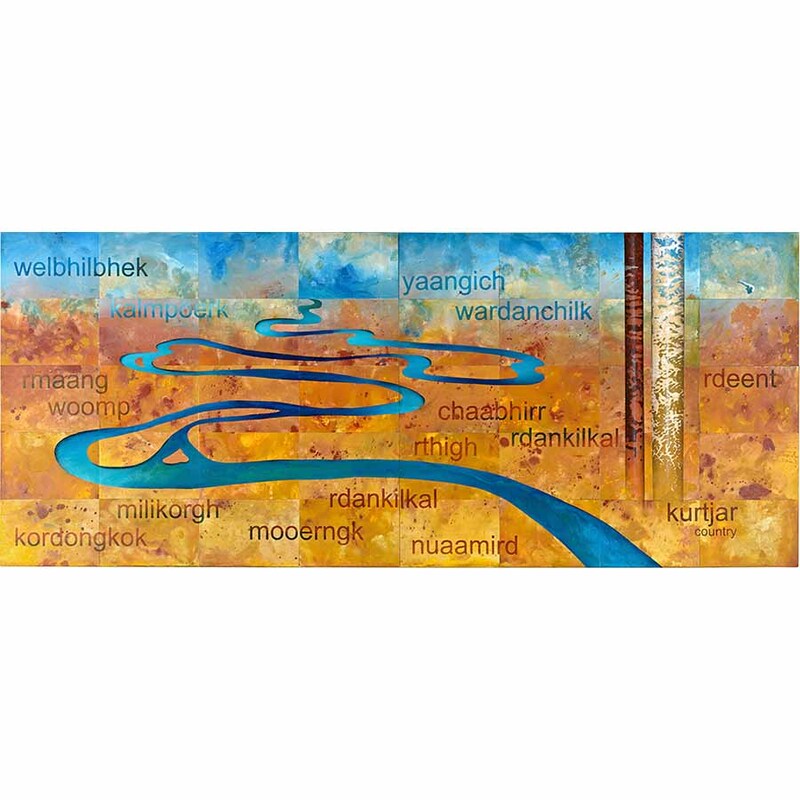 This painting is about Kurtjar country in the far north of Queensland, and our country runs from the Normanton River up to the Stanton River, and there is about a million acres of land there that is our country known as Delta Downs. At the top of the painting you see the blue coming into the land, but there is no coastline as such because the land is so flat. There are no mountains in our country – the water melds right into the land across big massive plains and mudflats that flood in the wet season, and so the water comes in quite a way. It is my mother’s family country, and the words in the painting describe the places and things found there. I do not speak the language but I think it is very important to know of these things. This language gives me a greater feeling for the country and what’s been happening there. My clan totem is the bloodwood tree… it is hard timber with a sap that seeps out like blood, and it grows all over our country from the mudflats on the coast to the savannah lands. I am in two places – because fishing and going out in the boat and all that has been, and still is, a major part of my life. I still do it as much as I can… fishing and hunting food. Then I go back to the cattle country and that is my country too. 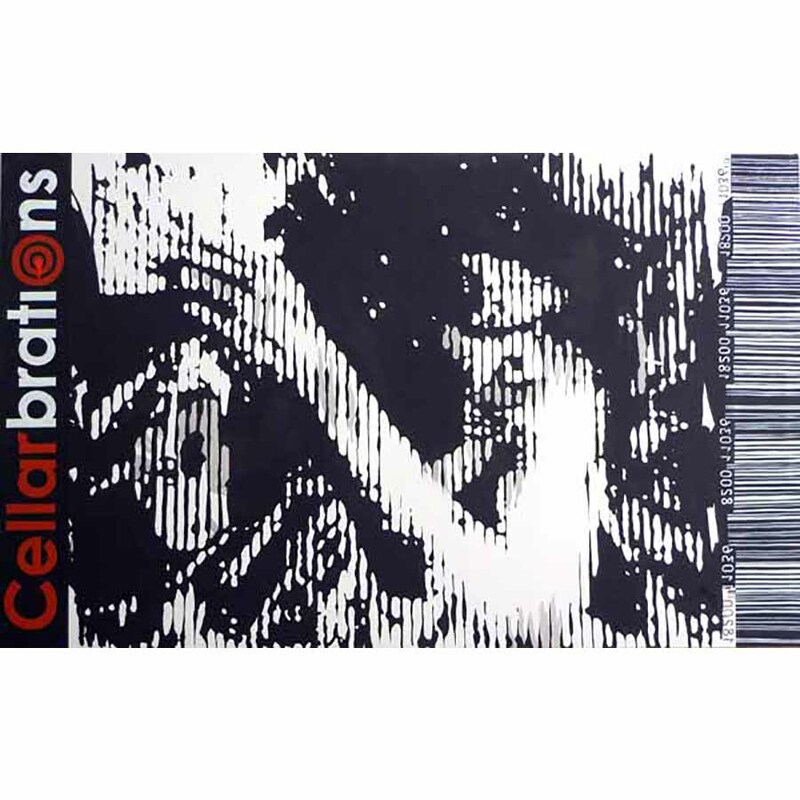 The central image in Cellarbrations is an Indigenous man throwing branches covered in paint over his shoulder to create a stippled body decoration. This image is also used in Uncle Bumble painting up, Gulf of Carpentaria, celebrating Kurtjar traditions of male initiation. Cellarbrations is a sharp, stabbing reminder of the extent to which substance abuse has become an issue in contemporary Australian society. As life in some Indigenous communities has become less structured and organised around seasonal activity and tradition, alcohol abuse has blighted many families. Young men who a few generations earlier would know precisely who they are and what their status is within a traditional kinship structure, now struggle with identity. Charging up is a form of celebration that is far removed from the experiences of rights of passage and culturally meaningful milestones. Ian worked in various industries before studying Visual Arts at the Northern Territory University in the mid-1990s. Throughout his art practice, he pays tribute to the story of the Kurtjar people in his homeland of the Gulf of Carpentaria. Ian has worked prolifically in his studio in Far North Queensland over the last years and developed a number of series, focusing on paintings and installations. 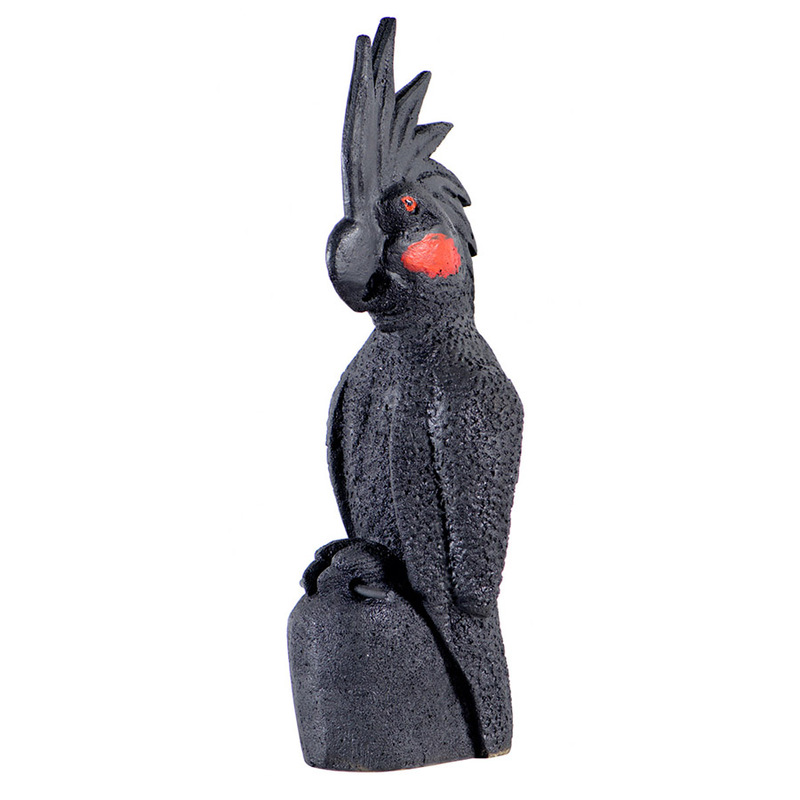 Recurring subject matter in his works comprises characters, sites and memories, which are important to the artist, such as Bloodwood totem and black cockatoo. Ian was the winner of the 2010 Glover Prize, Tasmania, and has been selected as a finalist three times in The Wynne Prize at the AGNSW. His works are held in numerous private and public collections nationally. The Black Cockatoo, or the Palm Cockatoo, is the largest species of cockatoo. It boasts solid black feather colouration, large open crest, bare red cheeks, and a red and black tongue. The beak of this bird is so enormous that it never fully closes. The Black Cockatoo is found in Northern Australia on Cape York Peninsula. A courting male cockatoo will choose a stick, trim it to size, and then drum with it on a hollow branch. Male and female may perform a drum duet when their chick is old enough to leave the nest. It is the only cockatoo that builds a nest. The male and female build it together during courtship by dropping sticks into a hollow log. The sticks collect and form a little platform. This keeps the egg and chick from drowning if water collects in the log's bottom. Painting continues to be an integral part of asserting identity for Indigenous Australians in post-traditional life. Equally important is connection with land and the physical elements. 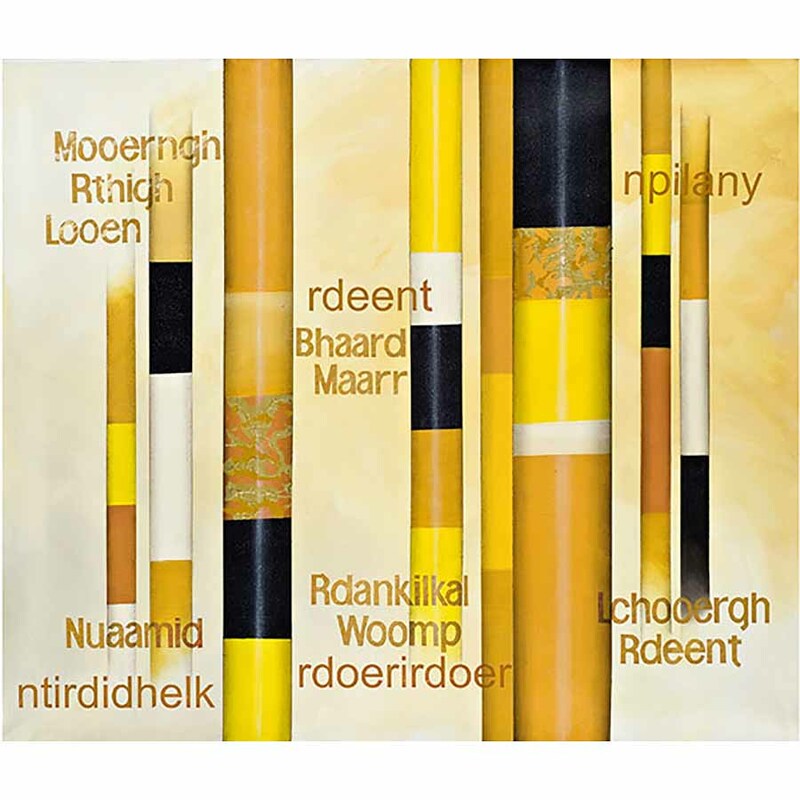 The title Totem reflects the artist’s desire to explore the relationship between the physicalities of land and the cultural beliefs and traditions of Aboriginal Australians. 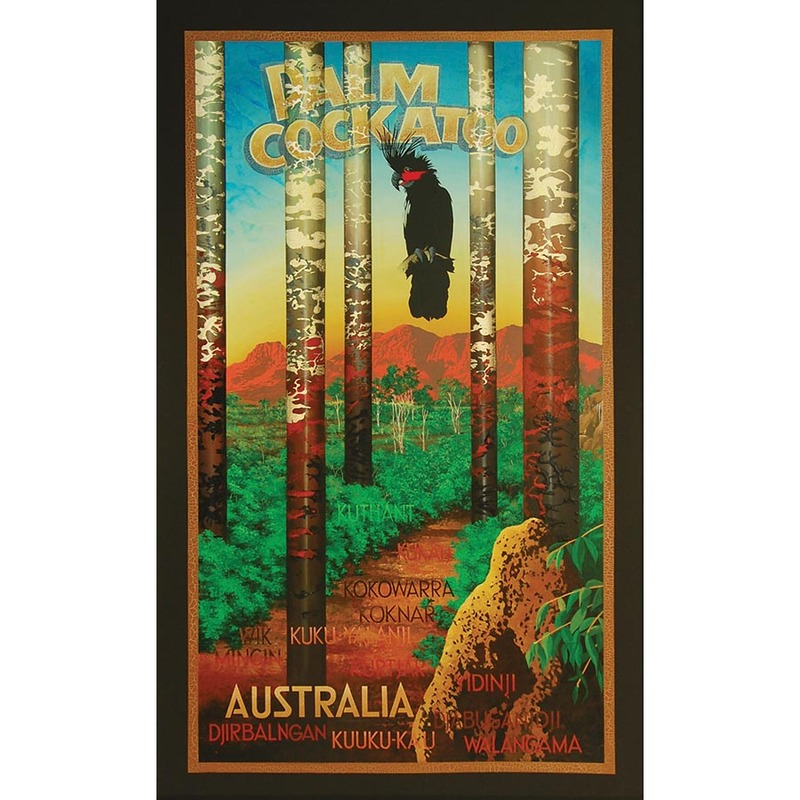 One of the most important species of flora on the artist’s traditional country on the Gulf of Carpentaria is the Bloodwood tree, a eucalyptus encased in a thick, rough bark. The design in this painting reflects the natural shape and textures of the Bloodwood tree, a hardwood often used for making didgeridoos. The tree gained its name from the red sap that flows from it when cut. Colour is used to represent the various stages of growth and change in the tree through the seasons. 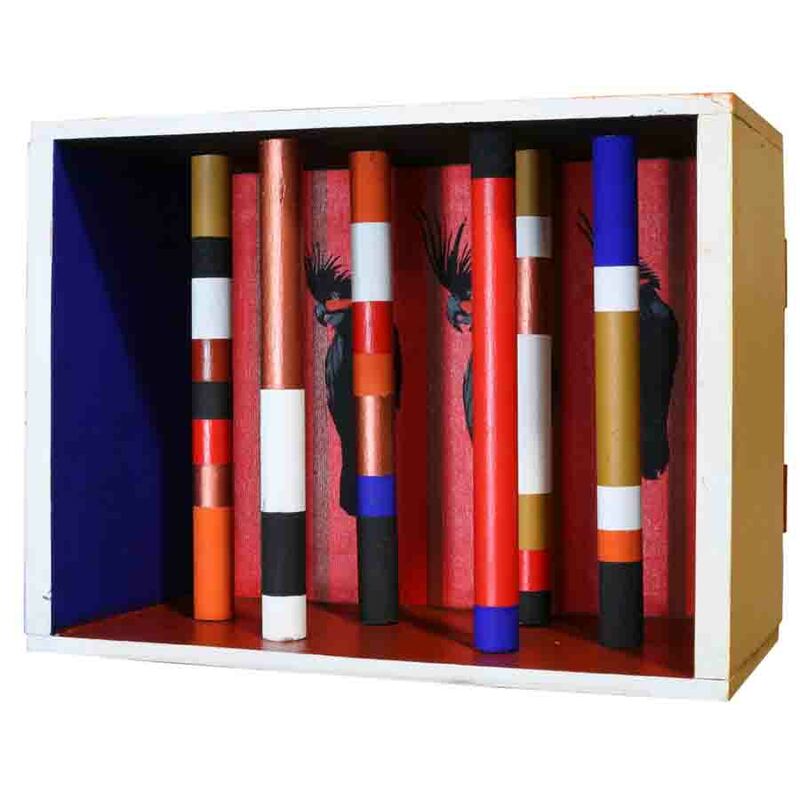 Looking through the Bloodwood Totem, we are offered a rare insight into a hybrid world, perceptions of indigenous culture and connectivity filtered through a stylish and very precise urban familiarity. 2014 - 2017 Saltwater Country travelling exhibition developed in partnership between Museums & Galleries Queensland and Gold Coast City Gallery. Curated by Michael Aird and Virginia Rigney. Gold Coast City Gallery, Australian Embassy Washington USA, AAMU Museum of Contemporary Aboriginal Art Utrecht Netherlands, Manly Art Gallery and Museum, Gladstone Regional Art Gallery and Museum, Cairns Regional Gallery, Gafton Regional Art Gallery, Mornington Peninsula Regional Gallery, Tandanya National Aboriginal Cultural Institute, Bunbury Regional Art Gallery, Western Plains Cultural Centre, Lake Macquarie City Art Gallery, State Library of Queensland. Ian Waldron’s eighth major solo exhibition, Into the woods is about mystery, not the solving of it, but a celebration of how embracing it enriches our lives as nothing else can. The woods serve as an analogy for the metaphysical world, represented visually as the scrub on Waldron’s country. Waldron lures the viewer down a path, leading them into an animated landscape, a progressively deepening meditation on totems. The artist has been exploring these totems in his work for more than a decade. As the power and significance of these symbols deepens and solidifies in Waldron’s psyche, so does its visual manifestation. Australian forests are termed bush or scrub, but the term woods has been invoked because it is associated with another world, a place once passed into is removed from other realities and has its own set of physical properties and moral values. In popular European folklore the woods are painted as a place of mystery and adventure, to be treated with caution. If you go into the woods today you’re in for a big surprise, Hansel and Gretel, Little Red Riding Hood, Snow White, mysterious houses in the woods. It is a place where transformative journeys take place, marked by rights of passage, trials, adventure, hardship, tests, symbolic objects and sacred places. It is a place for the unexpected and the unexplained, one of the few contexts where there is no expectation of logical explanation. The images of scrub which serve as backgrounds for many of the works were taken with Ian’s iPhone while he was travelling through country on other business. The capturing of these images was incidental rather than posed. This is evident in the relative ordinariness of the locations. They are not sweeping landscapes or even particularly picturesque. They are of spare, scrubby forest. Having been burnt recently new growth is emerging. This renewal can be read as part of the continuing cycle of life. It was only when Waldron looked at them later that their potential as artworks became apparent. “The process of creating these works isn’t about the technical precision of presenting a photo-realistic image. I’ve used this other way of painting what I’m seeing in the landscape. Not exact replication of the landscape but seeing beyond this, seeing and looking at the mysteries of life and wondering about the physical and the spiritual, how they intersect, about the totemic landscape, my place in this world. What does the future hold, where have I been and where am I going? When you are the keeper of certain stories, how much do you share? That’s where the mystery of the Hairy Man comes in, he is an allegory for this. People might catch a glimpse of him from time to time and sometimes there is a chance encounter. But that’s it – the Hairy Man is in his own territory, he’s in charge, and if anyone gets too close he might wrestle with them. How did he end up where he is? Why does he disassociate himself from mankind, how did that come about? Why is he hairy? Why does he appear bigger than life when he does appear?1. While the scenes incorporate natural materials and depict landscape features of Kurtjar country on the Gulf of Carpentaria, they simultaneously represent an imagined space. This space is a representation of the space in my consciousness for exploration, examination and observation2. To better represent this space Waldron has extended his practice to include boxed dioramas. 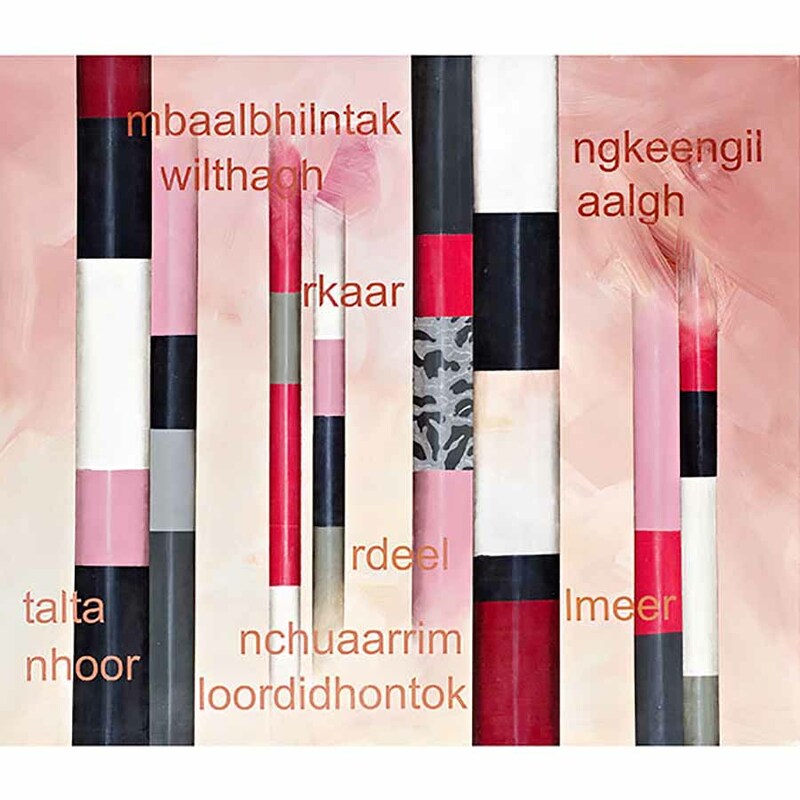 I would like to think that the techniques employed in these new works offers new paths into my art and culture, potentially contributing to increased audience engagement with urban Indigenous artistic expression3.